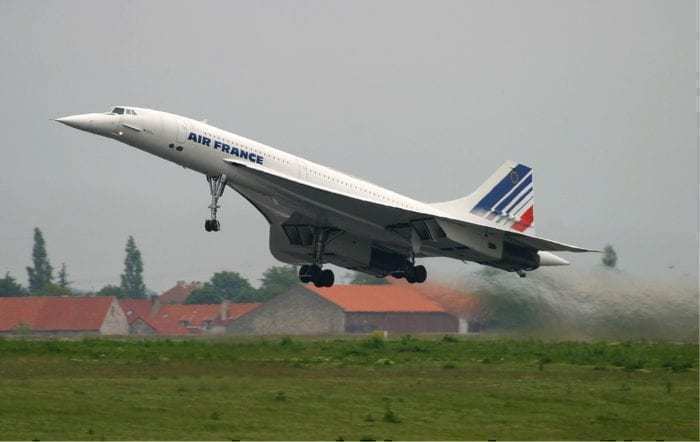 If Concorde Flew Today Would It Be Profitable? One of the most infamous aircraft of the past is the Concorde. Traveling faster than any aircraft before it, the Concorde could cover transatlantic routes in as little as 3.5 hours. Despite the hype, the Concorde went out of service by the mid-2000s with no clear successor. That begs the question, would the Concorde be profitable today? It is important to first recognize who flew the Concorde. The most iconic flyers were British Airways and Air France. In fact, they were the only operators of the Concorde. The Concorde was very much a luxury aircraft. Given the sleek style, the number of passengers it could carry was significantly reduced compared to other transatlantic workhorses like the 767 or A300. With limited headroom and width, the aircraft could only support a 2-2 layout. As a result, 128 passengers was the maximum seating capacity for the aircraft. The tiny A220 can fly a similar number of passengers on the same routes! Given this, ticket prices were exorbitant and catered to the highest-end travelers. British Airways and Air France mainly flew the aircraft from Europe to large business hubs like Washington D.C., Boston, and New York. What about the sonic boom? One problem with the Concorde was the sonic boom. It was a loud aircraft given the speed it was traveling at. This made it a nuisance for locals. At one point, Concorde couldn’t fly to the United States. 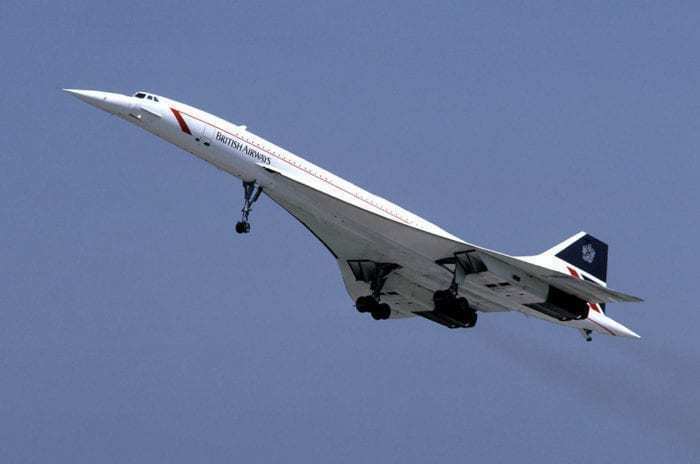 Due to concerns over the Concorde’s sonic boom, the aircraft was banned by Congress. After some persuasion, Washington D.C. and New York City were opened for supersonic flight. This, however, exemplified the problem with the Concorde. It could only, really, fly transatlantic routes. This severely limited the ability of the Concorde to fly passengers long-haul. For business travelers, the flight was a great opportunity to get between high-end cities. However, the demand wasn’t always there. Given the exorbitant prices, the Concorde wasn’t for everyone and only catered to an exclusive group of passengers. Where is the Concorde today? No Concordes have been in active operation since the early 2000s. 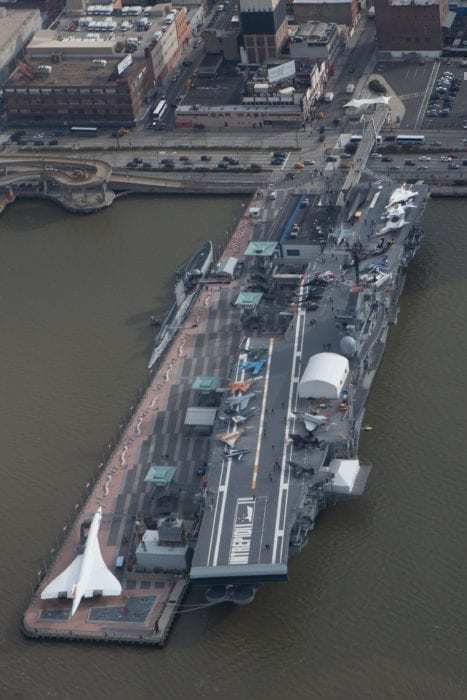 Some are on display, and one Concorde rests at the Intrepid Museum in New York City. 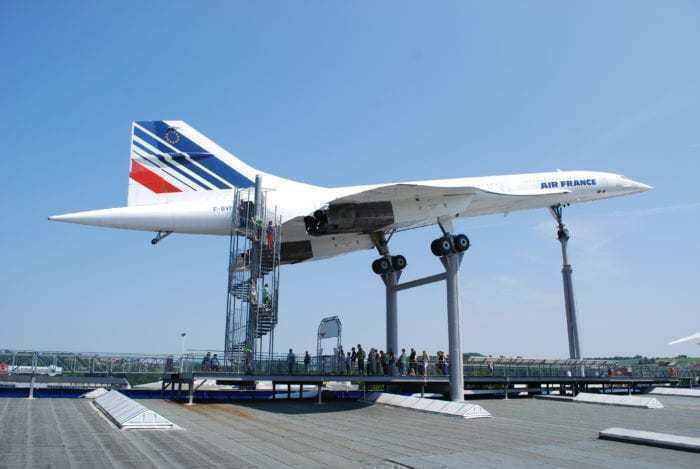 Air France also has a Concorde on display at Auto & Technik Museum Sinsheim in Germany. This further symbolizes the Concorde as a passenger “wow” factor. The Concorde was great for advertising, it was an iconic aircraft, but it just couldn’t sell. Airlines couldn’t make the aircraft work. Would the Concorde be profitable today? No. With a maximum capacity of 128 passengers, limited operating range, and high fuel consumption there is very little wiggle room for an airline to make a profit. Even at full capacity, the price point for this flight would be tremendously high. 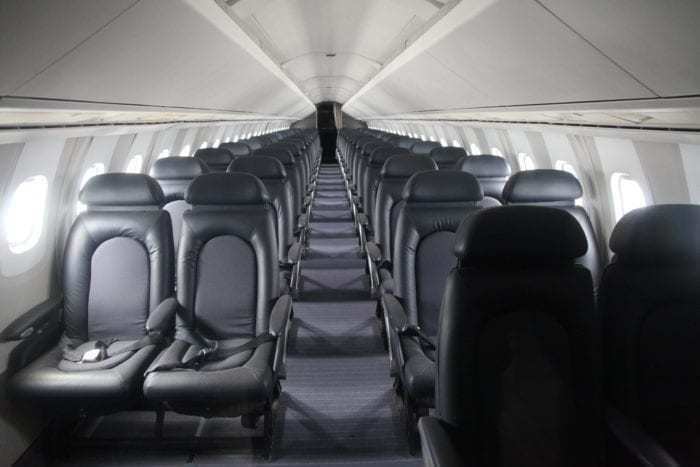 Given the narrow fuselage and limited headroom, the modern advances in business class seats could not be possible with the Concorde. Most certainly, British Airways could not put their new Club Suite on the aircraft. In short, no. Every year, more technological breakthroughs bring us closer to the return of supersonic flight. Companies like Boom Supersonic are looking forward to the day for supersonic flights to return. Should supersonic flights be successful, there are a few factors they could learn from the Concorde. 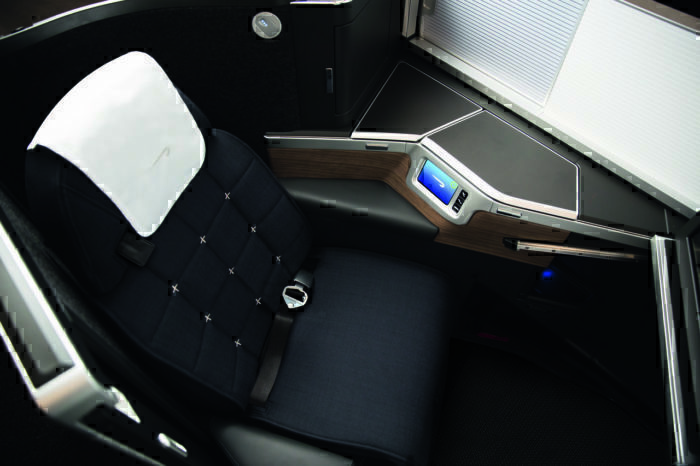 First, the cabin needs to allow for more seating flexibility and capacity. Airlines should be able to have multiple classes and seating configurations. Second, the noise problem needs to be fixed. Quiet is king when it comes to modern aircraft. Finally, the aircraft needs to be fuel efficient. An aircraft isn’t making money on the ground. Airlines will want enough fuel efficiency for the aircraft to fly when the fuel prices are high and when they’re low. The Concorde was a great advancement. Now, we just need to wait for the next iteration of supersonic travel. Have you flown on the Concorde? Do you miss the Concorde? Let us know in the comments! I ‘ve admired how tiny the whole body of that plane and the sharp movable nose when ultimately time to land on the ground.I wish the manufacturers has to revive it again by solving the issue of noise since you take little hours in the air.Thanks. This is a really dumb write up by somebody that clearly has no clue, or is too young to remember Concorde. The airplane only ever flew LHR/CDG-JFK/IAD, and for a short while, on from IAD to DFW in a short lived joint venture between AF, BA, and Braniff. There were plans to fly it to Singapore with Singapore Airlines, but I don’t believe it ever was in regular service on that route. Inside accommodations were 2 x 2 and more similar to a DC9 than an A320. The airplane’s main competitor was the 747, not the A300 or 767. Please do some research. I’m not sure if you actually read the article, but I did say it only mainly flew to place like New York and D.C. The Concorde did operate some flights to Boston with BA and a flew to Mexico City via DC/JFK with Air France for a short period. The Braniff flights were operated as subsonic flights. I did also indicate the aircraft could only support a 2-2 layout. And, in comparison to transatlantic workhorses, the 767 and A300 were much closer in terms of capacity than the 747. I never indicated the Concorde was similar to the A320 either.